Now in a new edition, Who Says? 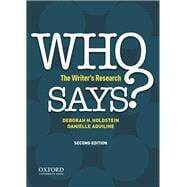 The Writer's Research is an innovative and brief research guide focusing on information literacy. The text shows students not only how to do research but also why research is important. --What does it mean to conduct research in an age when we are bombarded by collaborative information through online media and databases like Wikipedia? --Who owns this information? How do we know? --As information circulates and changes, do the lines between audience and author blur? --How should these changes alter our expectations as readers and as writers? By prompting students to think critically about matters of ownership and authority, Who Says? not only shows students how to find and incorporate credible sources in their writing, but also encourages students to synthesize their own ideas with the ideas of others, leading them to develop more confident and compelling voices as writers. Chapter 1 What Is Information? Being Overwhelmed--This Is a Process?